A company implements offline files for all Windows 10 devices. A user reports that they are running low on free disk space. You need to determine the amount of disk space being used by offline files on the user’s device. B. Instruct the user to launch Resource Manager. D. Instruct the user to launch Sync Center. A company has tablet devices that run Windows 10. You configure auditing for devices. You need to determine which audit policies are configured on the devices. Your network contains an Active Directory Domain Services (AD DS) domain named bcdtrain.com. 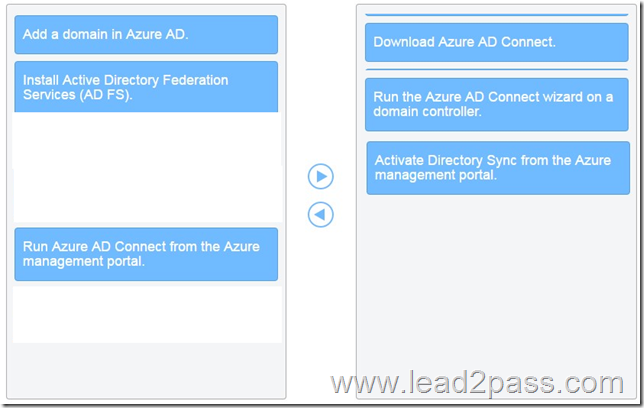 You need to synchronize the on-premises users to the Azure AD domain. What should you do? Select the three steps that you should take and place them in the order in which you should perform them. You deploy Windows 10 to devices on your network. The network contains a Windows Server Update Services (WSUS) server. 1. Computers in the company’s production department must receive updates from a server that runs WSUS. 2. Updates for the computers in the sales department must not occur for one month. 3. All computers in the company’s marketing must be grouped for WSUS reporting. 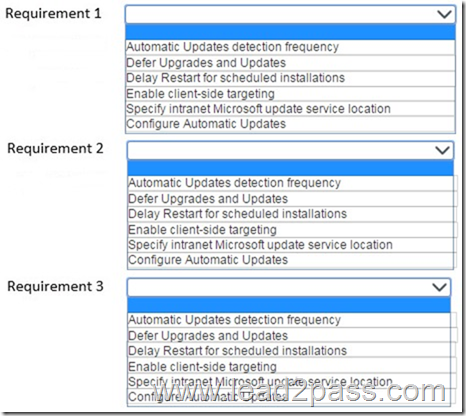 You need to configure the relevant group policy settings to meet these requirements. Which policy settings should you configure? For each requirement, select the policy setting that you should configure from the drop-down list. To meet requirement 1, you should configure the Specify intranet Microsoft update service location policy setting to have the computers use the WSUS server. 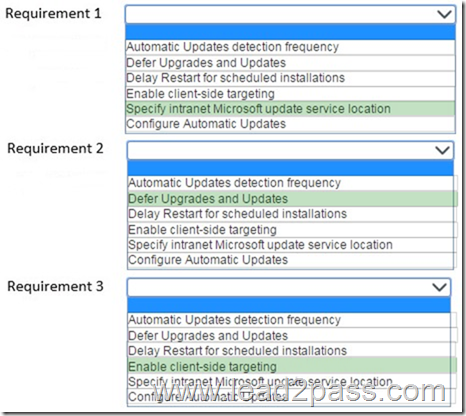 For requirement 2, you should configure the Defer Upgrades and Updates setting. Inside that setting is an option to pause updates until the next monthly cycle. This gives administrators time to fix temporary issues they may have, while still trying to keep the computers as up to date as possible. Requirement 3 requires client-side targeting to be used. This joins the computers that are covered by this setting to a logical grouping inside the WSUS console that can then be used to approve updates or to run reports. 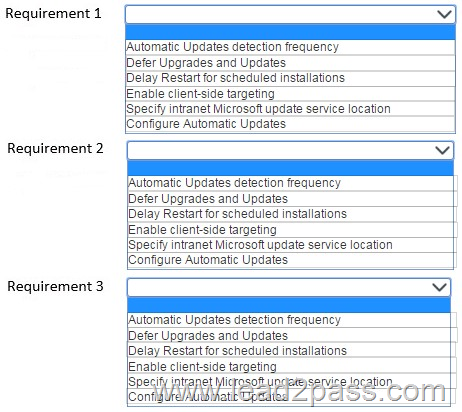 The Automatic Updates detection frequency setting specifies how frequently to check for updates. The Delay Restart for scheduled installations setting allows you to delay rebooting a machine pending an update installation that requires a restart. The Configure Automatic Updates setting allows you to specify when to install updates, or whether updates occur automatically. It cannot be used to set the update source. 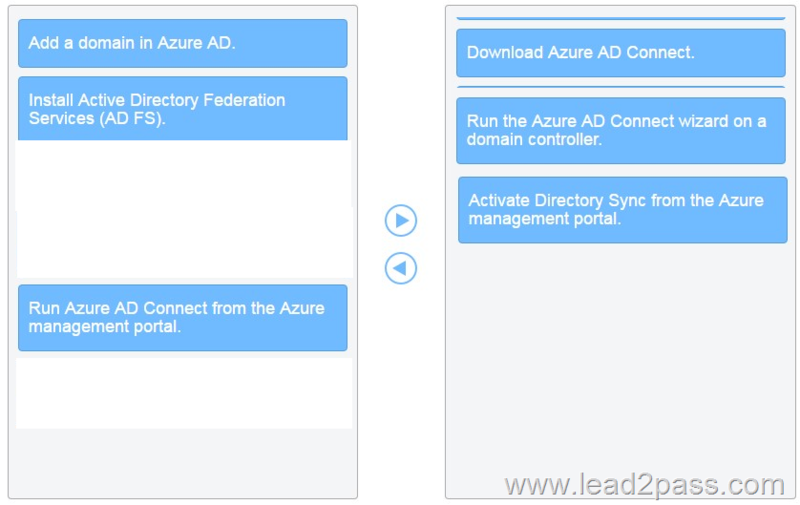 You have an Active Directory Domain Services (AD DS) domain named Company1.com with Windows 10 client computers. 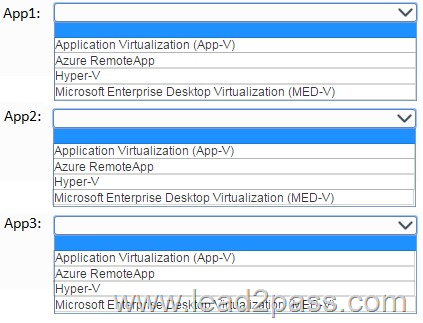 You are planning the app deployment strategy for apps named App1, App2, and App3. All three apps are not compatible with apps that are currently installed on the Windows 10 computers. App1: Must be able to run without using the local processor. App2: Must be able to run without network connectivity and must minimize computer overhead for running the application. App3: Must be completely isolated from the client computer operating system and must be able to run without Internet connectivity. You need to recommend deployment strategies for the apps. Which deployment strategy should you recommend for each app? For each app, select the appropriate option from the drop-down list. 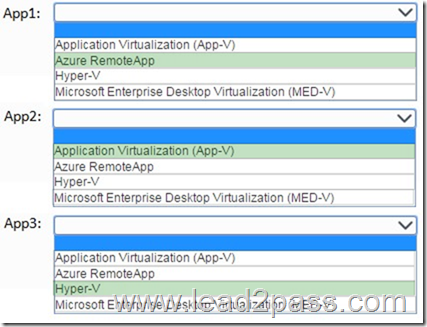 You should use Azure RemoteApp as the deployment strategy for App1. App1 must be able to run without using the local CPU. An app deployed with Azure RemoteApp runs on hosts in Microsoft Azure datacenters. Only its window is displayed on the client computer. All of the other options run locally and use the local processor. You should use App-V as the deployment strategy for App2. App2 must be able to run without network connectivity and must minimize computer overhead for running the application. 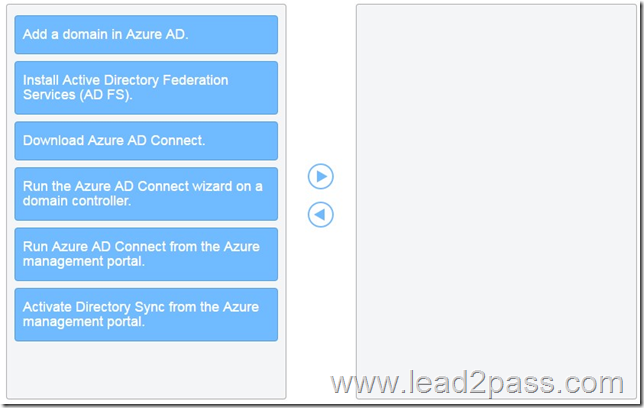 Azure RemoteApp requires Internet connectivity. 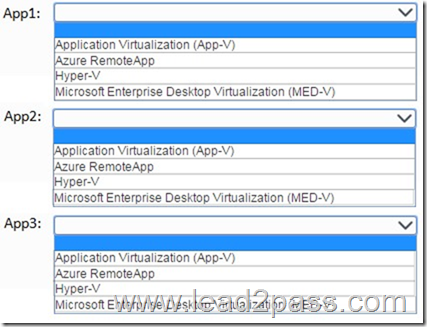 Hyper-V or MED-V requires a virtual machine to be running locally. App-V has considerably smaller overhead because it does not require a virtual machine to run. 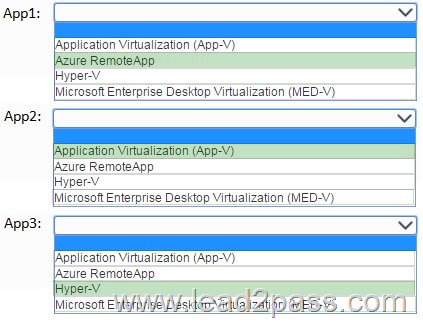 You should use Hyper-V as the deployment strategy for App3. App3 must be completely isolated from the client computer operating system and must be able to run without Internet connectivity. Only Hyper-V meets all the requirements. 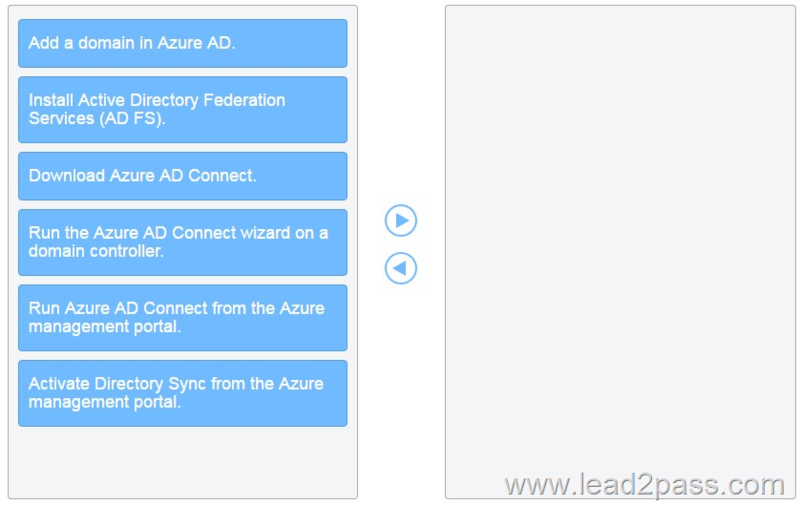 Azure RemoteApp requires Internet connectivity. MED-V does not run on Windows 10. App-V apps are not completely isolated from the client computer operating system because they can read the Registry.